I'd like to introduce to you...Weaver Drive. This really wasn't in the plans. Our latest project, Lincoln Avenue, exhausted both of us on many levels. So, we had made a commitment to each other that we wouldn't take on a project that could be completed in 4-5 months. However, this gem of a house had fallen out of contract with a developer and hadn't gone back on the market yet. (possOur agent and good friend, Darcey Arena, asked Lance to go see it. Shortly after, Lance says to me, "I need to talk to you about something and I'm a little nervous". He's never nervous, so I got nervous. He said, "I found a house but it doesn't fit into the plan. But before you freak out, let me just say this: It has three things you love: It is Mid-Century Modern. It has a circular driveway. And it has Birch Trees." That was the beginning of the end. I saw the house and we both fell in love. That being said, house flipping is a business, not a love affair so we spent a lot of time running the numbers to see if it would be feasible. Now we're in deep. We have been doing a little digging to figure out the history of this house. We found out that it was custom built for a couple in 1955. They were doctors who hired a protogé of Frank Lloyd Wright (possibly Hans Ostwald) in San Francisco. We are still trying to find out who it was. We'll keep you posted. This is the room that knocked my socks off. It is fully paneled in mahogany siding. Everything is super rectilinear. This was a defining feature in the Mid-Century Modern (MCM) movement. Definition of Rectilinear: Contained by, consisting of, or moving in a straight line or lines. Here is a picture of Dr. Alexander Yankley and Dr. Doris Parkinson. This was the couple who commissioned an architect to custom-design the home for them. During the escrow process, we were blessed to meet these two lovely women, Karen and Meredith McIver, when they came to clean out the house. They were the daughters of the second owner's of the home. While they didn't actually live here, they spent many weekends and holidays and were able to share many stories about the time they spent at Weaver Drive as well as the doctors who built the house. This painting (left) of Karen was done awhile ago, by her mother, and used to hang in the Weaver living room. 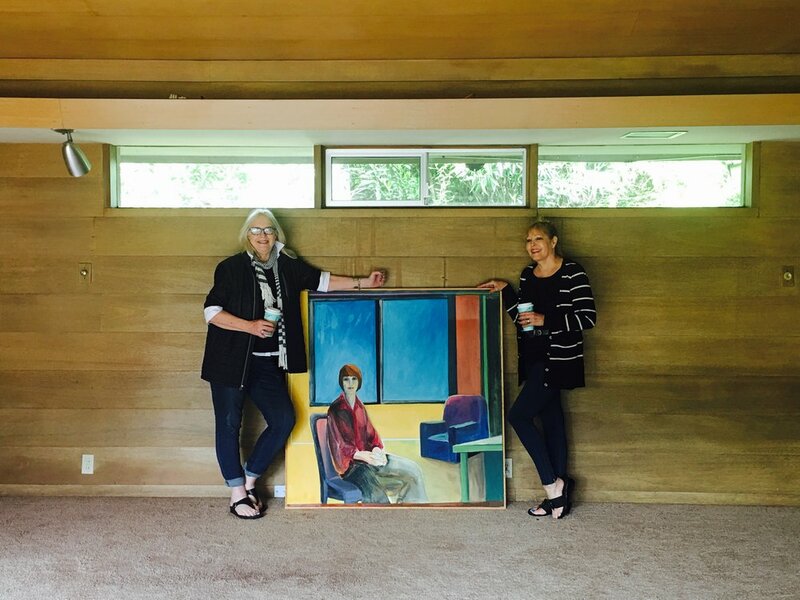 Karen (left) and Meredith not only gave us the photo of the painting. They also GAVE us the actual painting. Here they are pictured with it the day they gave it to us. (Left) Dr. Alexander Yankley, in his older years (wife not shown) and his good friends, Phyllis and James McIver, who lived in the house after him. Their daughters are featured above. The house is U-shaped which creates a courtyard with floor-to-ceiling windows looking out. We are thinking about facing the fireplace with rectilinear stone, which was a big Frank Lloyd Wright (FLW) feature. What's the vibe we're going for here? Following the windows around from the living room, you'll find the dining room. As you can see, it is heavily wood paneled. The kitchen was the first clue that these doctors were tall people. All of the counters are significantly taller than today's typical counter height. They were really ahead of their time in terms of design. All of the custom cabinets have notches to open and close without hardware. The strange thing about this kitchen is that it's quite a large space but they put the fridge right in the middle of it, cutting the room in half. However, it's a nice space to work in and we already have big plans for it! Two things are very odd about this room. The first is that it is quite small in relation to the house. The second is that the large wood-paneled wall is the wall facing the enormous yard with beautiful trees. We are going to extend the master 7.5 feet into the backyard with large windows facing in that direction. What's the vibe we're going for? We were mesmerized by this bathroom. Again, tall counter tops. And custom-designed stainless steel counter with built-in sinks. And take a look at the mirror. It's floating off the glass and lit from behind. Super innovative, right? Isn't this cool? We are guessing this was the doctor's man cave. This is all custom cut mahogany paneling. We are still trying to figure the vibe of this room. It's hard to properly capture the fabulousness of this backyard. This lot of 15,000+ square feet and a lot of it is in the backyard. The stairs go down to a small second level where we may put a gas fire pit. Then the slope continues down to a field with trees. You literally can't see another house or hear anything from back there. It's magical! What's the vibe we are going for? We recently visited the San Francisco MOMA. They've installed a three story living wall, which took our breath away. Its inspired us to bring this element to Weaver in the courtyard opposite the living room. Oh, one more thing: We might be on TV. A local public access station, K-Cat, is interested in creating a TV series, featuring the remodeling of Weaver Drive. We were filmed for the walk-through last week and were interviewed. As you can see, Lucy had some fun in front of the camera, too. They are in the process of securing underwriting. We'll keep you posted! Stay tuned and we'll keep you posted on the progress.